I paused for a moment on the narrow trail and gazed at the rugged California landscape. What a beautiful place to hike! Suddenly the silence was shattered by the distant roar of motorcycle engines. I listened for a moment. They were getting closer. Someone else had decided to take advantage of this beautiful day in the mountains. Immediately I heard doggy feet pattering toward me. My Australian shepherd raced up, bouncing and wagging from head to tail. We surely had named her right when we registered her as “Blue Puff Tempest”! I reached down and petted her fluffy blue merle coat. She had so much energy—like a tempest in a teapot! We continued up the trail together, Puff sniffing everything in sight. When I heard motorcycles roaring up behind us, I moved well off the path, and motioned for Puff to follow. We waited while two motorcycles zoomed past. Although they disappeared quickly, they didn’t leave us much quiet. Every now and then I heard their loud motors spoiling the peaceful stillness of the afternoon. After a few hours I decided to turn back toward home. I started down the trail and Puff alternately bounded ahead and lagged behind to investigate things. She was about 150 feet from me when I heard the motorcycles again. This time, I knew we were in trouble. The trail ahead had been carved out of the steep mountainside. On one side towered a vertical cliff, much too steep to climb. The other side dropped into a deep ravine. I can press myself against the cliff and let the motorcycles pass, I thought, but what about Puff? She was likely to jump around in excitement as the motorcycles approached. They might wreck, or worse yet, plunge off the trail into the ravine below! “Puff! Off!” I motioned to her to stand at the side of the trail. She seemed to see the hand signal, but she was obviously puzzled. How could she get off the trail? In her bewilderment she stood sideways in the middle of the trail, looking up toward the cliff. Now she was in the most dangerous position of all—blocking a good share of the trail. Only a few moments were left until disaster. Frantically I motioned for Puff to sit. “Sit! 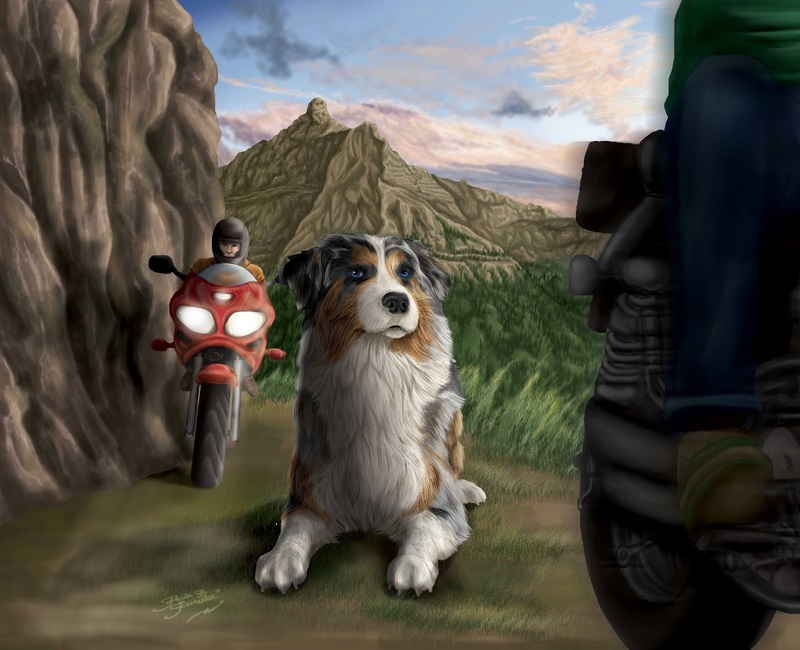 Stay!” I doubted that she could hear my voice over the approaching motorcycles, but she could see my hand signal. Immediately she dropped down. As she did so, a small miracle happened: Puff turned toward me, so that she was now parallel with the trail. Although she was still right in the middle, the motorcycles might be able to drive around her—if she stayed perfectly still. The motorcycles rounded the corner and I pressed against the bank, watching to see what would happen when they reached Puff. The first motorcyclist swerved slightly to the right and missed Puff. She didn’t move. The second passed on her left, continued past me, and then disappeared around a corner. Still Puff sat motionless, her eyes on me, waiting for her next command. “Come, girl!” I called. Puff raced up the trail to receive my wholehearted praise for her perfect obedience. As we continued along the trail to the car I wondered, Am I as obedient to my heavenly Master as Puff was to me? Puff didn’t understand why she had to lie down in the trail, but she trusted me enough to obey—even when it must have seemed completely wrong to her. Should I be any less obedient to my all-loving, all-wise heavenly Father?